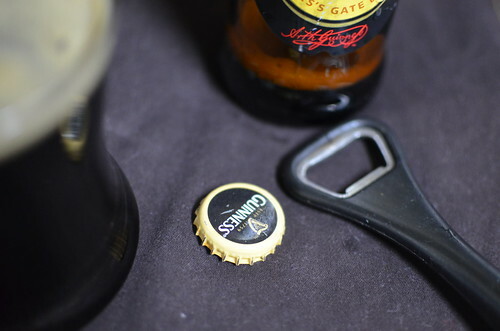 There are a couple of Guinness brands in Nigeria: Foreign Extra and Extra Smooth, with Foreign Extra considered the ‘original’. The Extra Smooth is an extension of the Foreign Stout brand, introduced in 2005 to produce a stout with smaller bubbles, making it easier to drink. For this bread, I went with the Foreign Extra brew. Foreign Stout is an interesting name, and it describes the brews of Guinness exported outside of the Irish Dublin Factory. Guinness Foreign Extra Stout (FES) is a stout produced by the Irish brewer Guinness, which is owned by the drinks multinational Diageo. It is more heavily hopped than Guinness Draught and Extra Stout, and typically has a higher alcohol content (at around 7.5% ABV). Originally brewed by Guinness in 1801, it was designed for export, and the extra hops and alcohol acted as a natural preservative for the long ship voyages the beer had to undertake. FES is the Guinness variant that is most commonly found in Asia, Africa and the Caribbean, and it accounts for almost half of Guinness sales worldwide. In 2011, over 4 million hectolitres of the beer were sold in Africa, where Diageo intend to grow the product into the continent’s highest selling beer. 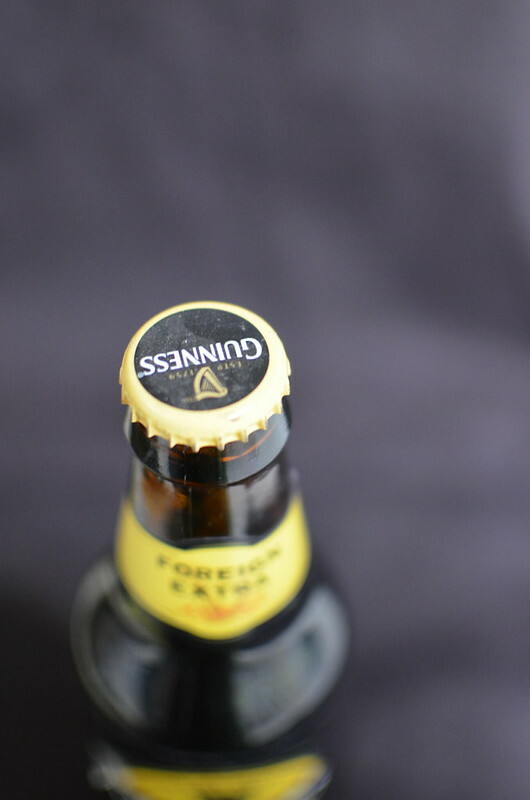 In some overseas markets, Guinness Flavour Extract (GFE) is blended with locally brewed beer in order to produce FES. The guinness has a malty flavour which works well with maple syrup, brown sugar and rye flour to give a depth of flavour, more often associated with whole grain loaves. However, the result isn’t brick heavy but light and soft which is a welcome surprise. Scald milk by warming it on the stove top or in the microwave till it is warm to the touch. Add the butter to the warm milk and stir till the butter melts using a dough whisk or a wooden spoon. Then add the maple syrup, brown sugar and salt to the warm milk. Stir in the stout and egg. 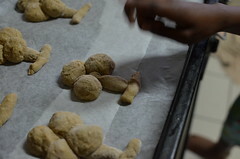 To this mixture, slowly incorporate the rye flour, followed by 2 cups of the all-purpose flour. 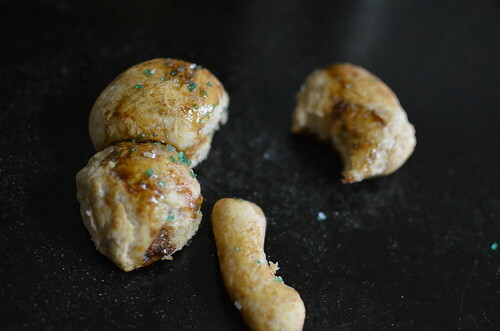 Sprinkle the yeast over the liquid-flour mixture and stir well to incorporate before adding the extra cup of flour.The dough should be nice and soft. Cover with a greased lid, or loosely with greased cling film and leave to rise on the counter for at least 2 hours. Once the dough is risen, gently deflate it by stirring. Cover and refrigerate for at least 2 hours or overnight to allow the flavor and texture improve. When you’re ready to bake, line a large baking sheet with parchment paper. 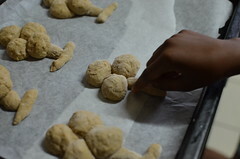 Then turn out the chilled dough on a lightly floured work surface and knead gently into a smooth ball. Try to flatten out the dough into a rectangle to aid cutting it up. 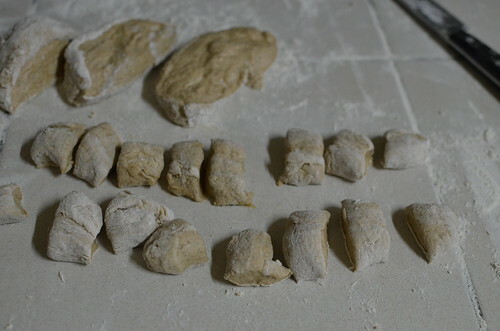 Cut dough into 12 equal parts. Each part will be cut into smaller bits to make the four-leaf clover. 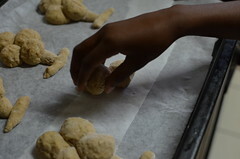 For each piece of dough, cut the dough into four 1″ pieces and the remaining into 2 equal pieces. 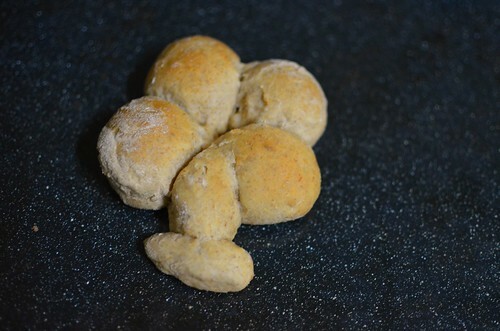 Roll each of the inch bits into balls by putting a piece of dough into the centre of one palm. With the other palm, make circular motions, using the centre. 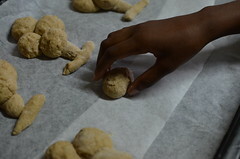 If the dough is sticky, dip your palms in flour to help. Repeat for the other 3 pieces. These are the ‘leaves’ of the clover. Roll the remain 2 pieces into strips – these will form the stalk and branch for each clover. Repeat for the remaining pieces of dough. I like to make these conveyor-style, and then assemble them all at one. 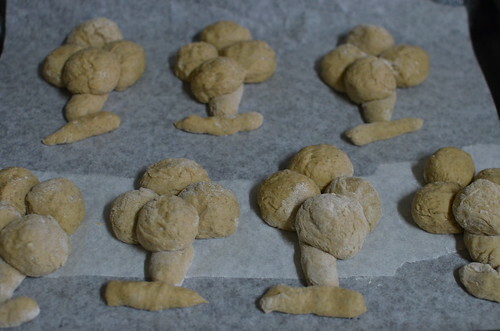 To assemble, place a ball of dough, followed by two balls just below and on either side, then follow with a stalk in the centre of the three balls of dough, and attach the branch at the base of the stem. 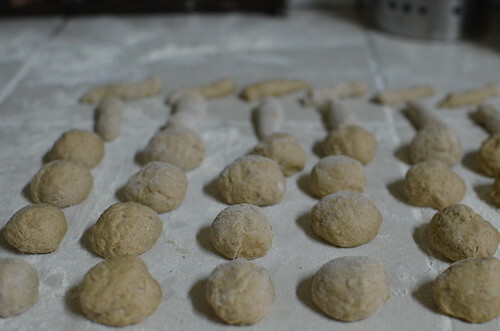 Finish with the last ball of dough on the stem, opposite the first ball of dough you placed. 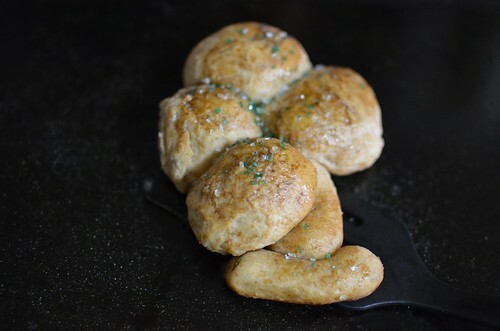 Repeat to assemble the other clover buns. Cover with greased cling film and let rise until doubled in size in a warm place, about half an hour. Five minutes before the rolls are ready to be baked, pre-heat the oven to 180 degrees C (about 350° degrees F). 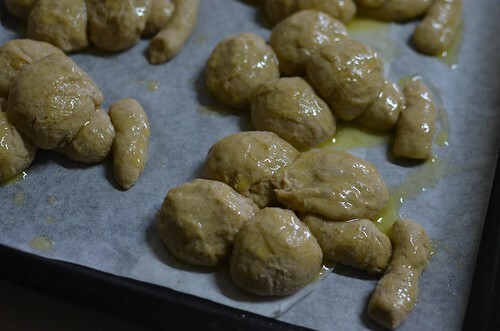 Gently brush on the melted butter-caramel mixture and then pop the bread into the oven. 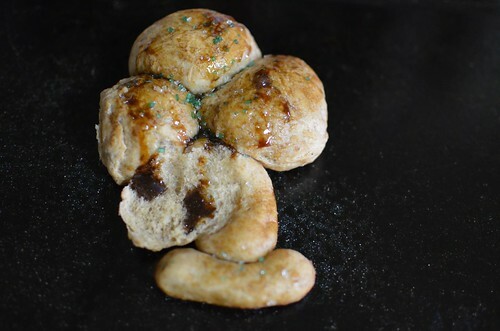 (I brushed some rolls with this mixture and others with plain melted butter: those with the caramel sauce emerged a wonderful golden brown). Bake for 15-18 minutes in the centre of the oven. When ready, turn off the oven, remove the tray and brush with remaining melted butter – caramel sauce. Sprinkle on the green and white sugar. Gently remove the buns from the tray using a fish slice. Serve warm…with extra Guinness caramel sauce to dip or drizzle. The kids loved it – the rolls: both the taste and the look, especially since they assembled them and got to eat their ‘own’. 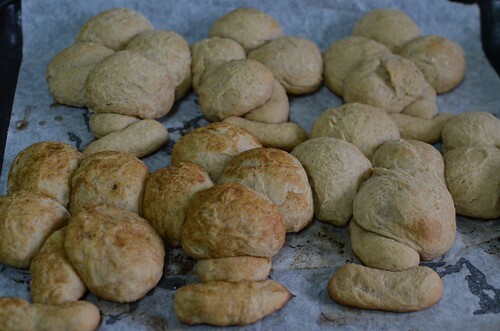 The rolls were soft and warm and full of caramel-toffee notes, as well as wholegrain ones. You got a hint of coffee but only a wisp, which was enhanced by the caramel sauce. I believe the rye and the Guinness worked well to bring this about. The surprising part for me was how they loved and LICKED the sauce. I thought the bitter notes would put them off but I thought wrong. The bowl was licked clean and a demand for more rolls in the coming week’s lunch boxes is on my table! 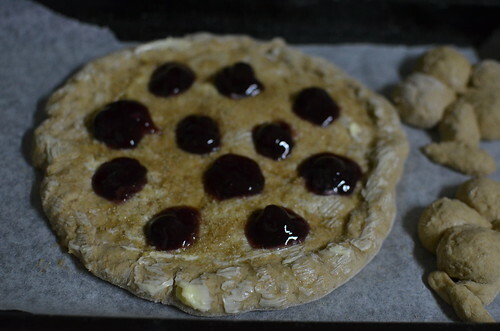 A cherry flat bread was well received, Galette de Perouges style, topped with butter, sugar and left over cherry pie filling. 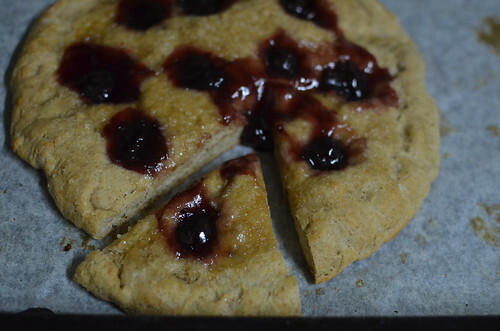 It ended up like a baked bread and jam, which wasn’t bad. Thank you Paddy, for the inspiration and once again, happy St Patrick’s day.